A. Lange & Söhne has since its resurrection been very good at holding its value. A strong and consistently applied DNA over the entire model range, combined with an exceptional finish have laid the cornerstones for this. That might make especially the more complicated and rare watches in their collection prime candidates to one day become the stars at watch auctions. Especially the Triple Split seems to be perfect for this, as it combines its outstanding pedigree with a unique and exceptional complication. Rolex is a fixed name in the auction world. 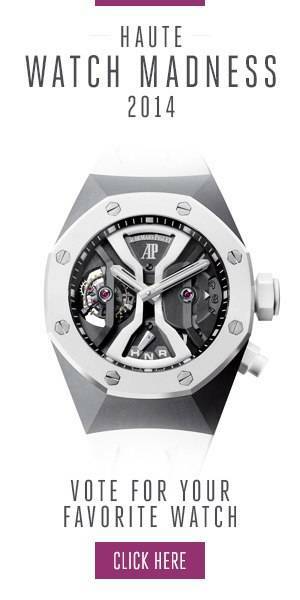 Many of their watches have broken records, not in the least that of most expensive wristwatch ever sold at auction! To determine which current watch from their collection might be an auction favourite in the future is quite difficult. While gem-set watches in general never perform too well at auction, things might be different for the Everose Daytona with a rainbow sapphire setting. They are currently high in demand, and it seems to have enough staying power to remain that way (or even increase it) once Rolex stops the production. When Patek Philippe launched the Calatrava Pilot Travel Time in white gold in 2015, it was received with quite a few raised eyebrows; the perfect conditions for a future auction favorite to be born! How much can change in a little over three years? Now the demand for the Calatrava Pilot Travel Time has gone through the roof. The only question open seems to be which version will be more popular on the auction roster in the near future, the original white gold version, or this rose gold variety with a brown dial? Independent watchmakers often have a hard time securing a place in the auction world as decent performers, with Philippe Dufour as the only firm exception to this rule. He might in the near future be joined by Richard Mille whose creations have also shown a remarkable staying power thanks to the use of innovative materials and their complex movements. The fact that Richard Mille also combines this with limited production and a recognizable DNA will for sure be an advantage, so it might not be long before watches like the RM 50-03 Split Second Tourbillon McLaren F1 take their place as record breaking watches at auction.